We awoke this morning with an urgent message to call home. Through a terrible Skype connection, I spoke with my mother and learned that my grandmother, Etta Watson Zukerman, had died yesterday evening. She was 99. In keeping with Jewish tradition, the funeral is held as quickly as possible. It will be Friday, which meant we could not even entertain the possibility of getting home in time. So instead, I spent the day remembering sleeping over at her house and getting Fresca in bed, her phenomenal chocolate chip cookies, Passover Seders at her house, and accompanying her to high holiday services since I returned to the DC area. We are especially happy that our children got to know their great-grandmother so well. 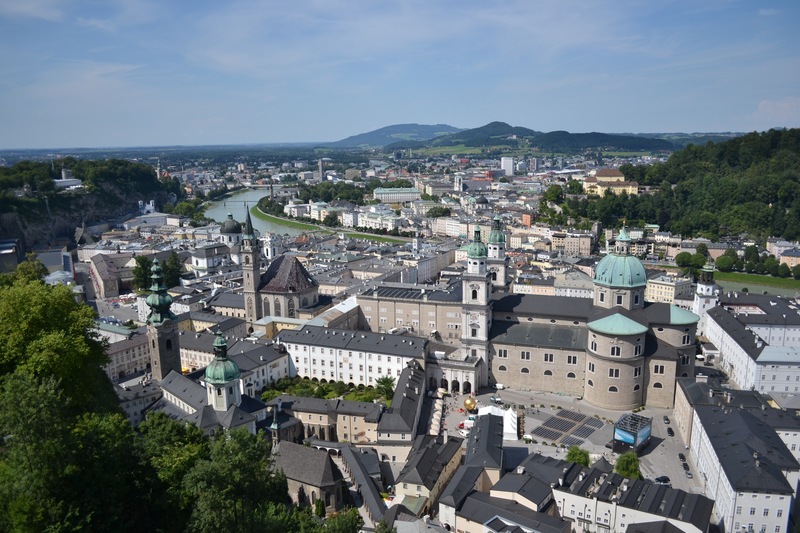 Our trip called for us to move on To Salzburg, so we made the 1 hour drive. 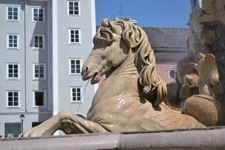 Our hotel, the Hotel Alstadt Salzburg is a boutique Radison Blu, well located with a beautiful room. 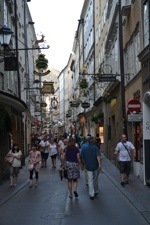 We started right away with the Rick Steves walking tour, although we stopped to book a Sound of music tour for tomorrow. We did about the first half of the tour, including a trip up the funicular to the castle which offered breathtaking views of the city. It was hot today, around 90, so we went back to the room to rest. A few hours later it was significantly cooler and we were able to thoroughly enjoy the rest of he tour. Dinner was at Zom Morhen, a Frommers recommended restaurant. We went traditional Austrian, I had boiled beef and Ellen had goulash. We then found an open cafe and had a small dessert. We called back home to talk to the kids, as Andrea had come down from New York for the funeral. We miss being home with family now but keeping on touch has helped. This entry was posted on Thursday, August 2nd, 2012 at 2:36 pm	and tagged with 99, death, Etta Watson, grandmother and posted in Salzburg. You can follow any responses to this entry through the RSS 2.0 feed. David, I always enjoyed your FB posts about your grandmother. She enjoyed a very long life, and you were blessed to enjoy her company for so many years. It is completely unfair that you could not attend the funeral, but more significantly, you spent time with her when she was alive, and that’s the important part of life. My thoughts are with you.